The Strip Leech is one streamer that should be in every warmwater angler's fly box. Weight Lead Wire .030 dia. 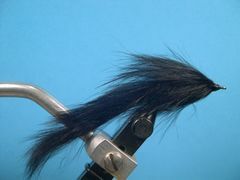 The Strip Leech is a simple fly to tie. All you need is a hook, lead wire, thread, and an eight-inch piece of Zonker Strip. 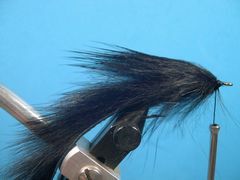 In his book "Fly Tying and Fly Fishing For Bass and Panfish," Tom Nixon, a pioneer in our sport, wrote that flies made with rabbit strips were popularized by such notables as Tom Schmuecker of Wapsi Fly, Inc., Arkansas angler Tom Woods, and Montana's Al Troth among others. Tom goes on to write, "The reason those fellows used rabbit strips was quite simple; well conceived rabbit fur lures catch fish and that is about all that could be asked of any, fly, lure or bait." He tells about catching several nice bass on a black Strip Leech in a public pond in Warrensburg, Missouri and also claims that Tom Schmuecker has been very successful on Northwest Arkansas smallmouth streams with a Chartreuse Strip Leech made with lead dumbell eyes. 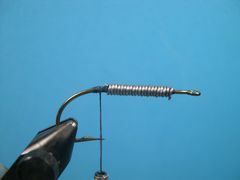 The Strip Leech in the tying sequence is weighted with lead wire but you could also incorporate lead dumbell eyes as Tom Schmuecker does or you could use a Cone Head Bead. I like to fish the Strip Leech with a sink-tip line. 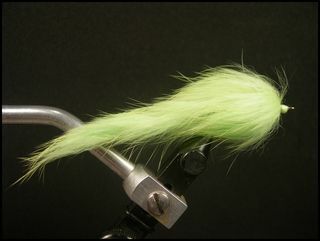 You would think that a lure made of rabbit fur on the hide in combination with lead wire for weight would sink quickly. That's not the case. The fly line I use is a floating line with a ten-foot sink-tip cut back to five feet. This type of altered line casts much better than a triditional sink-tip line. Because you're using a hook with a straight eye you could easily install a single-loop weed guard before the other materials are attached. In fact, that's a good idea because the fly should be fished in the weeds. Lay down a good base of thread from the hook's eye back to the hook's bend. Add as many turns of lead wire as possible allowing space at the front of the fly to tie of the rabbit strip and make a well formed thread head. 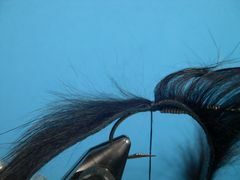 Moisten the rabbit fur to expose the hide at the point where you want to attach the fur strip to the hook. With the tying thread hanging at the hook's bend, bind down the strip to the top of the hook's shank with several very tight thread wraps. Move the front part of the strip to the rear of the hook. Move the thread to the base of that part of the strip that has been bound to the shank and take several tight wraps to make sure that the tail stays in place. Spiral the thread forward to the front of the hook in preparation to wrap the body. Wrap the rabbit strip forward making sure that the hide of each wrap of the strip is just touching the previous wrap. 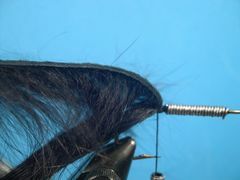 Stroke the fur back with the finger tips of your free hand as you wrap the strip up the hook's shank. This prevents binding down any hair as you wrap. Bind the strip down at the front of the hook with a couple of tight thread wraps leaving enough room for the thread head. Remove any excess rabbit strip before you form a neat thread head. Form a neat thread head and tie off with a couple of half-hitches or a whip finish. Coat the head with head cement and your Strip Leech is finished. The overall length of the fly should be about three and one-half inches. Sometimes I make the Strip Leech a little shorter by snipping off a bit of the tail.